A trade that had been widely rumored was finalized on the afternoon of April 26, 1985 as the Washington Redskins dealt their first pick in the upcoming NFL draft to New Orleans for RB George Rogers plus the Saints’ fifth, tenth, and eleventh-round draft choices. The 26-year-old, power-running Rogers had won the 1980 Heisman Trophy while at South Carolina. Chosen in the first round of the ’81 NFL draft by the Saints, he had a big rookie season, rushing for a league-leading 1674 yards with 13 touchdowns. The 6’2”, 225-pound Rogers was a consensus first-team All-NFL choice and was named to the Pro Bowl, an honor he received again in the strike-shortened 1982 season when he rushed for 535 yards in six games and the Saints contended for a playoff spot. However, there were off-field drug problems and Rogers was further hampered by a knee injury in ’83. He still ran for 1144 yards in 13 games but, in 1984, found competition from newly-acquired RB Earl Campbell, who was obtained from the Houston Oilers and reunited with Bum Phillips, once head coach in Houston and now in New Orleans. Rogers’ rushing total fell to 914 yards and he scored only two touchdowns. After four seasons and 4267 rushing yards, the Saints were willing to swing the trade with Washington (and would find that the once-great Campbell was at the end of his Hall of Fame career). The Redskins were still a fundamentally sound team under Head Coach Joe Gibbs, having won back-to-back NFC Championships in 1982 and ’83, with the former resulting in a Super Bowl victory, and topped the NFC East with an 11-5 record in 1984 before succumbing to the Bears in the Divisional playoff round. 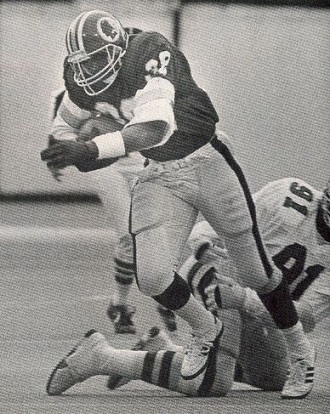 However, Washington’s once-formidable ground game had become a source of concern due to uncertainty surrounding star RB John Riggins, who rushed for 1239 yards but was 35 years old and hindered by a back injury, and Joe Washington, who was 31 and missed nine games with a knee injury (and was separately traded to Atlanta for draft choices). Riggins returned to the club for the 1985 season, but it was Rogers carrying most of the rushing load. He accumulated four hundred-yard performances, capping the year with 206 yards on 34 attempts in a win against the Cardinals. Overall, he gained 1093 yards on 231 carries, for a career-best 4.7-yard average, and scored seven touchdowns. Riggins contributed 677 yards and Keith Griffin, handling the third-down role that had been Joe Washington’s specialty, gained 473 rushing yards and caught 37 passes for 285 more (Rogers and Riggins had ten catches between them). The team went 10-6, but while the Cowboys and Giants did likewise, tiebreakers put Washington third in the NFC East and out of the playoffs. With Riggins retired in 1986, Rogers carried 303 times for 1203 yards (4.0 avg.) and a league-leading 18 touchdowns. The Redskins grabbed a Wild Card slot with their 12-4 record and, in his first opportunity to appear in the postseason, Rogers added another 202 yards on the ground, but while that included 115 yards on 29 carries in a first round win over the Rams, he was held to 15 yards on nine attempts in the NFC Championship loss to the Giants. Rogers spent an injury-plagued 1987 season running for 613 yards in 11 games and saw limited action in the Super Bowl victory over Denver in which RB Timmy Smith, a little-used reserve during the regular season, gained 204 yards on 22 carries. It was the end of the line for Rogers at age 29. He retired, citing nagging injuries. Overall for his three seasons with the Redskins, he ran the ball 697 times for 2909 yards (4.2 avg.) and scored 31 touchdowns. Rarely used as a pass receiver, he had 11 catches for 76 yards. As for the rest of the transaction involving Rogers, the 1985 draft choices that Washington received were used to take RB Raphael Cherry from Hawaii in the fifth round, Texas RB Terry Orr in the tenth, and G Raleigh McKenzie of Tennessee in the eleventh. Cherry was converted to strong safety, started five games as a rookie when veteran Tony Peters was injured, and intercepted two passes in his only season with the Redskins. Orr was on injured reserve and thus saw no action in ’85 but, utilized at tight end, spent most of the next eight years with Washington and caught 52 passes. McKenzie didn’t contribute much in his first year but he ended up staying with the Redskins until 1994 and started a total of 113 games at both left and right guard as well as center. He moved on to the Eagles in ’95 and finished his career with Green Bay in 2000. With the first round pick obtained from Washington, which was 24th overall, the Saints selected Tennessee LB Alvin Toles. He spent four seasons with the club, primarily as a reserve among a strong corps of linebackers, and his career was cut short by a serious knee injury during the 1988 season.